Combine grapes and coconut oil together in a bowl and lightly toss to coat. Place grapes on baking sheet. Bake in preheated oven until grapes begin to wrinkle and split, about 15 minutes. Take out and place into a food processor or blender and blend until smooth. Add grape puree to a small saucepan and add chia seeds, honey and vanilla extract. Gently bring to a boil then reduce heat and let simmer for 2 mins. Pour into a jar and allow to cool in the fridge. For the coconut part combine coconut yoghurt, maple syrup and vanilla powder in a small bowl. 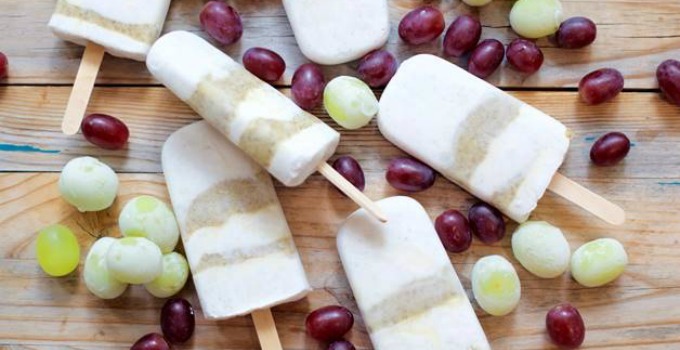 Put 1-2 tbs of the coconut mixture into each popsicle mould then top with 1-2 tbs of grape jam. Repeat until moulds are full. Place in the freezer and let set overnight or for at least 5 hours. Serve immediately or store in the freezer for up to 4 months.